Mutton Keema? We must have made, at least once or maybe hundreds over times? Pretty much. Otherwise? What am here for? Here''s to the recipe for this like a selling point mutton dish and mutton by itself for us Indians (Mutton Parathal, Masala Mutton Curry, Dalca and Mutton Kurma & Indian Mutton Meatball Soup)? No, no. I am saying anything. How do you save your time in making Mutton Keema. Buy minced mutton instead of doing the mincing yourself. Thereafter? Minced mutton cooked alongside potatoes and the customary Indian ingredients. Mutton Keema. Pow-Wow! 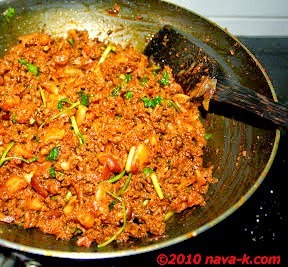 Into minced mutton, add all ingredients except oil, fried potatoes and coriander leaves. Heat oil and when heated, add shallots and mutton. Keep frying while breaking minced mutton with a spatula. Cook till oil splits and at the same time, scoop/drain out the oil floating on top. Lastly, stir in fried potatoes and coriander leaves. Love this! As a filling in a sandwich or a paratha roll its the best! Looks so tempting. Minced mutton and Potato is a really nice take!! Great recipe!Nice combination of Mutton and Potatoes.